This is Mary. She was, let's say, excited! One of two engagement photos we have. It’s a pretty crazy moment when you go from knowing you’re going to propose to someone and actually proposing to someone. I’m not sure if anyone’s “plan” has gone off without a hitch, but I can imagine the weight of the moment throws most everyone off balance -- it did for me. But, when I regained balance, what I was left with was absolute joy -- and a half bottle of wine to celebrate with. As I’ve mentioned, I was in possession of a pretty cool piece of jewelry and had been sitting on it, waiting on the right moment. Well, it lined up that Paris is about as right as it can get (*hears collective groans from the Cliché Monitoring Department* -- but let me finish), so it was all coming together. Then hit me: I am going to do this. When I decided to ask Mary to marry me, we were months away from our trip, so I had plenty of time to think about how I was going to do it and what I was going to say. It’s hard to talk about a proposal without addressing nerves or worries -- it’s only natural. So, neither how I would ask, nor what I would say worried me. And I for sure wasn’t worried about her answer. In fact, the biggest worry I had leading up to “the question” was if the ring would fit. Seriously, that’s a major concern for us fellas. So without much concern to dwell over, I had seemingly endless brainspace and time to come up with the perfect proposal. Except, every time I thought about it, I kept coming back to the same few descriptors for the moment: “Real;” “Genuine;” “Personal;” “Simple.” Those generally aren’t used in the same breath as “perfect.” It was clear to me that I could rack my brain for a YouTube-esque proposal, one where friends pull up on a private boat and family parachutes down from the French skyline to join us for the custom firework show plastered on the Eiffel Tower-framed canvas. Maybe I’d even convince Taylor Swift (for her -- I’d skew more Avett Brothers) to write and perform our own love song. But that didn’t feel “real.” It didn’t feel “genuine.” If for sure wasn’t “simple” and the more people involved the less “personal” it gets. It didn’t feel like us. “So what is ‘Us’?” I asked myself. It’s a complex question, sure, but the answer is pretty simple: “Us” revels in simplicity, in true experiences rather than big, borderline ostentatious, spectacles. We appreciate simplicity and minimalism and the inherent beauty in that. Maybe it goes back to our love of dining: often, the most simple dishes can be the most powerful. They let the ingredients shine, rather than masking them with unnecessary spices and garnishes. If you look at our relationship, in those terms, we’re the ingredients and we hope the dish our relationship serves is powerful and memorable. How, then, should I ask the person I want to spend the rest of my life with to marry me in a powerful and memorable way, all shaped by that idea of impactful simplicity? With simple food, of course! It didn’t take long for me to realize our relationship could be metaphorized with some of Paris’ staples: fantastic, fresh bread; wonderfully decadent cheese; and arguably the world’s best wine. 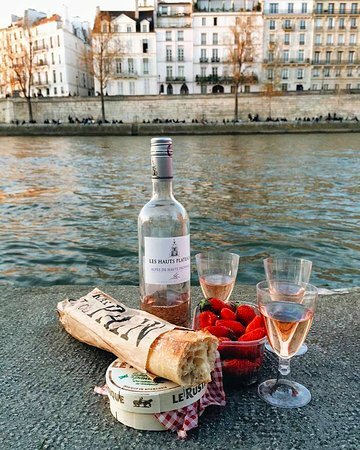 Those three, independently, make for a wonderful afternoon by the Seine without adding a life-time promise of love and commitment. So, on Sept. 25, 2017, we woke up in our AirBnB, got ready to explore the streets of Paris and headed out the door. In that time, I manage to sneak the ring in my pocket and thought to myself that today is a great day for a picnic by the river. The start of the day was a bit of blur. In retrospect, I feel a little bad because I was so distracted by what I knew was about to happen that I’m sure I wasn’t the best cafe and street-wandering partner. After rushing through a really cool area of town (sorry Mary!) I suggested we collect the three ingredients to a riverfront picnic. It wasn’t a hard sell, and within an hour we were perched on a raised garden bed on the river, adjacent to Notre Dame. The wine was opened and half-gone, poured into tiny plastic cups. The bread was hand-torn and nearly finished, along with the quarter-block of cheese. The entire time, instead of focusing on our conversation or how good the wine was, I was watching tour boats and joggers run up and down the river and its bank, searching for the “right” (read: least distracting) moment to get down on one knee. About 45 minutes into our picnic, I found an opening and abruptly stood up, and asked Mary to do the same. I wish I could tell you that I said something authors and playwrights will plagiarize for years to come, but the truth is I have no idea what I said. I’m not sure Mary does either. The weight of the emotional buildup landed squarely on my right shoulder and threw me off balance, knocking me down to my right knee. The only thing I could manage was a few words and fumbling hands. It was almost instinctual and I was just happy my hands didn’t drop the ring (although I forgot to take it out of the jewelers bag it came in after the resizing). It was very surreal. It was very simple. It was very us. After we both regained our balance, there was half a bottle of wine to celebrate with and only us to enjoy it. We poured some more in our plastic cups, cheersed, kissed again, snapped a selfie, and enjoyed the rest of our picnic and our trip. It was not a stopgap in our relationship, but a very natural continuation of it. It was as if we would’ve spent the afternoon the same way, without an engagement -- and I’m sure we would’ve. It was, simply put, perfect. Hey y’all, I’m Lee. I’ve been writing blogs for Nice Entertainment for a few years now. I love Hans and crew -- you should totally check them out if you’re planning a wedding -- and asked if it’d be cool to do a first-person series on the trials of planning a wedding. They love a good story, so, once a month, I’ll drop a new chapter. Hopefully it’ll be fun and insightful. If you have any questions about the experience, feel free to email to me. If we get enough, we’ll put together a Q&A at the end of the series. Older PostTypes of Wedding Venues: What’s Right for You?